Rushmore Casino is a classy online casino that has a wide range of slots, deposit today and get up to $888 free! Rushmore Casino is one of the classier online slots establishments, offering a large number of slots games that seem to be aimed at a more mature audience. The software lobby is designed with greater dignity than is found at many online casinos, which are often quite gaudy. It's all very minimalist, a relaxing place to spend some time and money on an impressive range of slots games. There are more than 80 different slots games available at Rushmore Casino, which utilizes the Real Time Gaming casino software. The range mostly consists of 5-reel slots with multiple paylines, but 3-reel slots, bonus slots, and progressive slots are also all featured at Rushmore Casino. You can win massive prize money on progressive slots such as Jackpot Cleopatra's Gold. These jackpots can often be worth tens of thousands, or even hundreds of thousands of dollars. Another big slots category at Rushmore Casino is video poker. With Loose Deuces, Sevens Wild, Bonus Deuces Wild, Deuces Wild, as well as Aces and Eights all available in 1-hand, 3-hand, 10-hand, 52-hand, and 100-hand varieties, Rushmore Casino has plenty to offer online video poker players. A selection of less common video poker games is also available, though most are only offered in 1-hand varieties. Sadly, Rushmore Casino has lots of slots, including progressive jackpot slots, but no slots tournaments. Instead, it offers live blackjack tournaments, which makes Rushmore Casino particularly suited to casino players who enjoy a mix of different games. If you enjoy playing table games as well as slots from time to time, blackjack tournaments can provide good value, as a small stake can keep you going for a long time. The prizes for the larger live blackjack tournaments often provide good value for money, with some tourneys worth thousands of dollars in prize money for a relatively small entry fee. Rushmore Casino does not offer the biggest welcome bonuses to be found online, but it does offer great value for the average player. At some online slots casinos, players can potentially claim close to $10,000 in bonuses, but they need to deposit almost that entire amount or more over a few months to claim the bonus. At Rushmore Casino, most players choose to use the standard deposit bonus, offering a 100% bonus on first and second deposits that can be worth up to $888 in total. Those who are more dedicated to slots and have the money to spare, however, can take advantage of the 400% bonus on first deposits that is worth up to $2400. All it takes to claim the bonus is a $600 deposit, well within the means of many players, yet the bonus will also provide great value for deposit amounts of as little as $25. 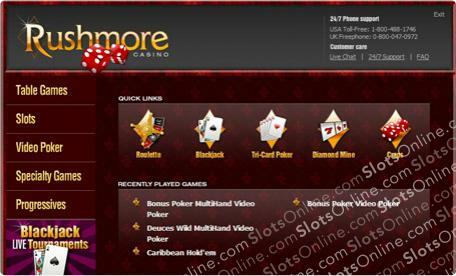 Rushmore Casino really does offer some of the best value casino bonuses online for slots players. Does not accept players from: No exceptions found.